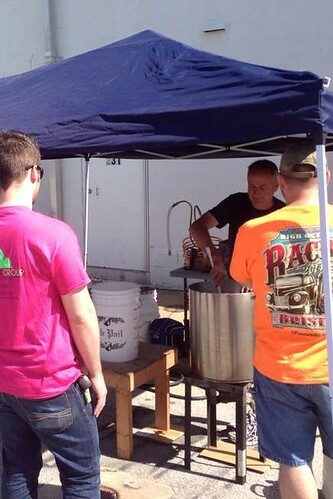 Last Saturday, 6 of us participated in 2014 Big Brew Day out behind St Louis Wine & Beer Making. Check out the national website for more details and award-winning recipes. 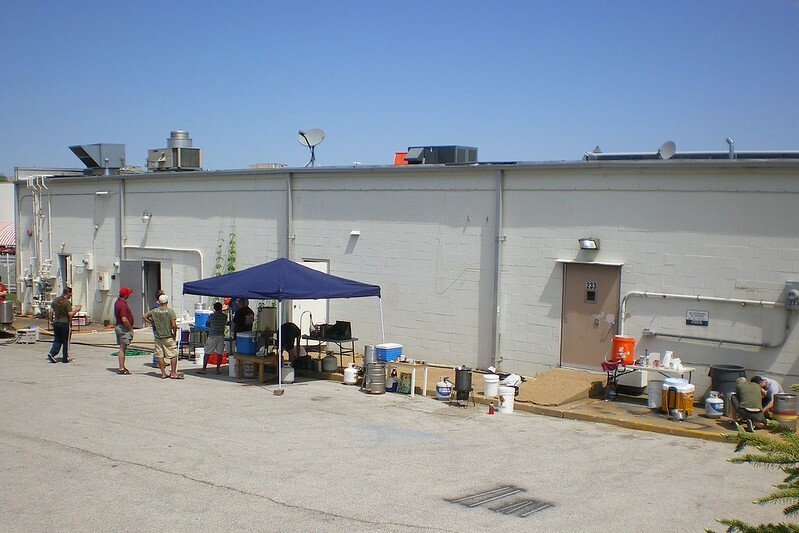 We were each generously provided space out back and 10 lbs free base malt, filtered water hoses, plus food and drink throughout the event. I brewed the following Simcoe Mild recipe. 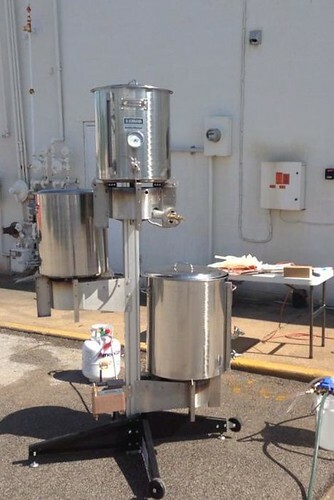 Timothy brewed an American Pale Ale, Jason brewed an American IPA, our esteemed President Tim C brewed his beloved Rye IPA, Kerth brewed the official Big Brew Day Russian Imperial Stout, and Michael brewed the official Big Brew Day Regal Pale Ale. Lots of shoppers and homebrew enthusiasts hung-out, observed and asked questions, swapped tips and boasts, drank samples of our previous homebrews, and just had a great time together. 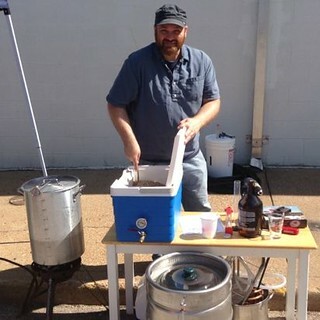 Who could complain about an afternoon social event where everyone leaves with a big batch of handcrafted beer?! It was an interesting "come as you are" affair. I'm not sure how much you can tell from the pictures, but on the far left, the store was showing-off a state-of-the-art Blichman 3-vessel tower with built-in propane burners, pump, whirlpool, thermometers, sight-gauges, etc. Yeah, crazy cool, right? In the middle of the shot, Kerth had his pop-up canopy and lots of fancy equipment. Next in line, that's my little wooden table with a few nice homemade pieces, but then there was Timothy with nothing but two small pots, a burner and a bucket. The span of all-grain sophistication doesn't get much wider than that. And as you can know, none of that matters much since we all brew delicious beer. with some recipe assistance from legendary brewer Alan Pugsley, being basically a watered-down Ringwood Porter recipe. I added 3 US gallons water ≈ 160°F/71°C and a pinch of Calcium carbonate (chalk). 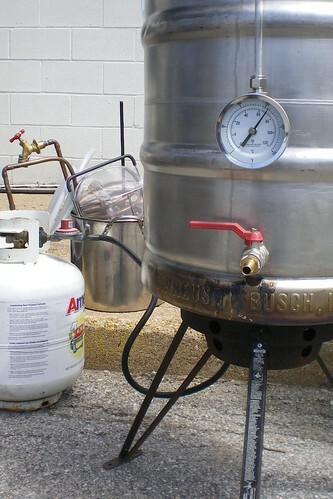 SINGLE INFUSION MASH ≈ 148°F/64°C for 1 hour, stirring periodically to aid conversion. 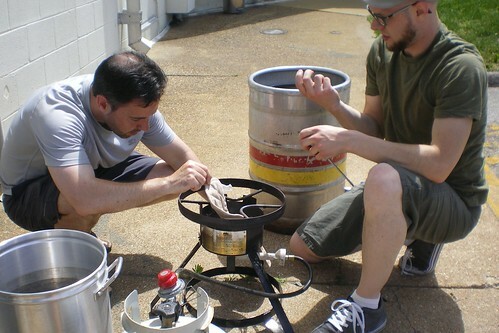 VORLAUFED then SPARGED for 45 min to collect 8 US gallons pre-boil wort. Afterwards, I Ditch-drilled it to AERATE. Ringwood Brewery proprietary dual-strain, originally from Hull Brewery, possibly Samuel Webster originally. NOT the same yeast as the single-strain Wyeast 1187. Fermented ≈ 69°F/20.5°C. *For the record, Mr. Pugsley recommends only ≈32 IBU using classic English Fuggle & Golding hops, taking care not to overpower the roast character from Black Patent malt. His personal opinion is that high-alpha American hops produce a tar-like flavour. If so, I must find tar delicious. Seriously though, I personally think certain fruity American hops work great in dark roasty ales, especially with subtly spicy Ringwood yeast. That said, if I had more UK Flyer hops, they would've been my first choice. Jason and Timothy making a quick repair to a burner stand. Kerth explaining the mash process. 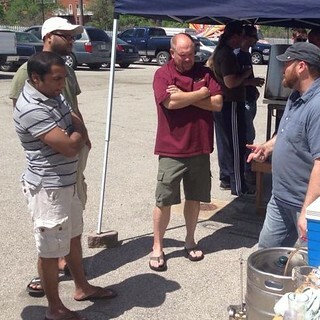 Me explaining the sparge process. Bringing my mild a boil.